Wondering how you can play a role in NACAC’s advocacy efforts? We’ll be broadcasting via Facebook Live on Tuesday, Jan 22 with Jim Fowler, NACAC Government Relations Committee chair and vice president for enrollment management at Salve Regina University (RI). 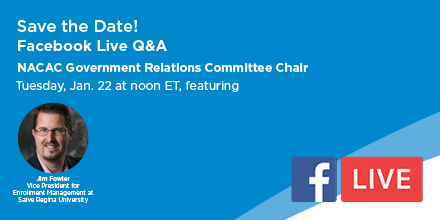 Tune in at noon ET to learn more about the work of the Government Relations Committee, Fowler’s journey to his role as chair, and NACAC’s policy priorities. Have questions about NACAC’s advocacy work or for Fowler? Ask them during the Live using the video’s comment section or submit them ahead of time via email.